Have you ever bit down during lunch or while eating and chewing you suddenly noticed you a piece of your tooth broke when biting? You look at the broken tooth part and wonder what part of the tooth may be. If this accident ever occurs you may need emergency dentistry and your tooth may or may not have pain. You should consult your dentist as soon as possible to address this accident to prevent further damage. What may have caused my tooth to break? Teeth, especially molars and premolars, are subject to chewing and night time and day time grinding stress. Over the years these teeth may have developed small and tiny fractures and cracks. If these fractures get large enough, they may eventually give away and break off. The tooth had a large filling and during chewing and biting this filling gave away. Sometimes it is also possible for a portion of the tooth to break off along with the filling. The previously had a root canal and was filled with a temporary filling or just had a large restoration. 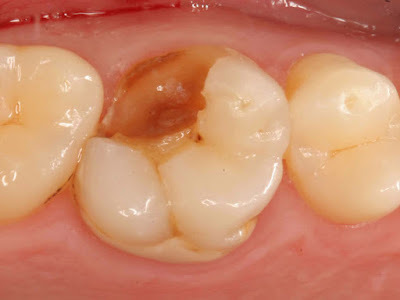 Teeth with a root canal are generally more brittle and without a dental crown the tooth make break. The tooth may have a filling that may have failed due to age and use. A piece of tooth is already broken and over time, this tooth became weakened due to tooth decay and use. Your teeth may have shifted, causing your teeth to be out of normal alignment. And as such the part of the tooth that is “out of position” may be prone to fracture. Will I have pain because my tooth broke when biting? It is possible not to have any feeling or sensation when a piece of the tooth has broken, especially if the tooth already had a root canal; not always the case though, as if a root canal tooth develops an infection, one may have sensitivity. If the part of the tooth broken off is small and contained within the enamel, it is also possible not to have any discomfort. Otherwise, it will be normal to have soreness and cold, hot, and eating sensitivity. If part of the tooth’s nerve is exposed this may be very painful and uncomfortable. What are treatment options to fix the broken tooth? Your dentist will do a comprehensive evaluation of the tooth and supporting gum and bone structures. Treatment options can range from doing nothing to smoothing part of the tooth, or a small filling if the broken portion is small enough. If the damage is more extensive, a full coverage crown or root canal may be required, or even possible extraction if the damage is not restorable. If you have any questions or concerns regarding why your tooth broke when biting, be sure to consult your family dentist for the best possible care and treatment.